Effects: helps reducing the secretion of the sebaceous and sweat glands, antiseptic, antispasmodic, digestive, expectorant, diuretic, prevents hair loss, activates mental activity, tonic, increases blood pressure, stimulates the heart. 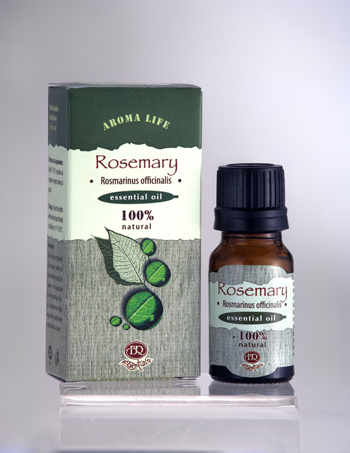 Benefits: Rosemary essential oil enhances memory, helps the concentration of attention, it is effective against mental fatigue. It has immunostimulatory and antioxidant activity. As a strong antiseptic it is used in colds, asthma and other diseases of upper respiratory tract. It has pain-relieving and stimulating effect. Excellent in massage, rosemary is used for relaxing tight, overworked muscles, relieving fluid retention and detoxifying the lymphatic system. Aromatic baths with Rosemary oil have wonderful rejuvenating impact - improves the skin, stimulates cell regeneration, helps to remove slag from the organism and relieves muscle pain. Rosemary oil has a toning effect, it is widely used in skin - and hair - care cosmetics to enrich creams, ointments and shampoos. It is reputed to help hair growth, makes a good tonic for the scalp and helps to prevent dandruff. Blends well with most spice aromas, lavender, bergamot, basil, juniper, pine, verbena, cedar and petigren. Use: aromalamp, inhalation, air fresheners, bath, massage. Attention: Contraindicated for epileptics, hypertonic patients, nursing mothers, pregnant women, children and people with individual intolerance to Rosemary, as well as before sunbathing.